Englewood, Colo.—Although John and Evelyn Baker are Colorado’s newest Garmat distributor, the couple said they are more accustomed to retrofitting existing paint booths for improved airflow than selling new ones. It was, in part, their expertise in repairing, maintaining, and upgrading paint booths that led the Michigan couple to relocate their business, John Baker Sales Inc., to Colorado in 2010. 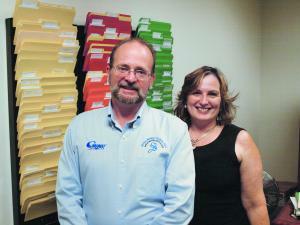 John and Evelyn Baker, owners of John Baker Sales Inc., say proper airflow is the most important factor in achieving a quality paint job. The couple specializes in spray booth maintenance, repair, upgrade, and now sales through a recent partnership with Garmat. Because “not everybody is in a position to buy a new booth,” John Baker said, there is a viable market for booth upgrades for greater efficiency, cost savings, and a better final product. In reality, Baker said, booths can be set up to be quieter, more balanced, have a hotter bake cycle, and result in a cleaner job. “If you’re getting more than two to three paint nibs per panel, we can help. “We think out of the box,” Baker said, with a grin, when describing his longtime spray booth business and area of expertise. “I love making something old work new. “One thing I have noticed in the two years in this market, is that there are a lot of Garmat installations,” he said, adding that they typically don’t need upgrades unless they’ve been altered from original design. “Many spray booths do not move enough fresh air during the bake cycle,” Baker said. If a shop is experiencing a dirty paint job, more airflow at the car is one remedy, he said, and keeping shop dirt out of the booth is another. If a booth’s operating pressure is too high, he said it will cause turbulence in the airflow and move dust around, leaving some in the paint job. Conversely, low airflow will not allow for the “envelope” of air to move fast enough around the vehicle or part, he said, and this will not prevent dust from getting through to the painted part. Baker said he’s developed several remedies over the years to solve those problems, making even cross-draft booths more efficient. Garmat booths produce great airflow, he said, in particular its Model 3000. To keep shop dirt out of a spray booth, even when the doors are open, Baker said he developed a retrofit called Automatic Pressure Control. With manual pressure, when the doors are opened, it creates slightly negative pressure, drawing dirt into the booth like a magnet, Baker said. Most body shop owners use fiberglass booth filters, changing them out by the calendar, not their effective life span, Baker said. “Fiberglass appears to be cheaper, but in the long run, there’s more paint in the booth because of it,” Evelyn Baker said. Even though no filter will trap 100 percent of paint and still allow air to pass through, she said, polyester filters catch more and afford longer intervals between blower cleanings, making cleanup work much quicker, with less downtime. The installation of a Magnehelic gauge can help shop owners ascertain when their filters need to be changed based on airflow, not time, he said, adding that the gauge measures air resistance at the filter. The Bakers have developed a custom method for putting a spray booth in what they call a Standby Cycle that produces heat makeup on demand, an option that Garmat also offers. Whether a painter is mixing paint, prepping parts, or simply away from the booth when it’s running, it is wasteful, Baker said. Booths retrofitted with the Bakers’ Standby Cycle recirculate the heated air and reduce the flame on the burner until the trigger on the paint gun is pulled. The Standby Cycle system uses a device that senses air traveling through a pipe when the air gun is in use, bringing the burner back to full flame. Xcel Energy will provide a rebate to body shop owners using this or a similar system, he said, anywhere from $500 to $1,000. The Standby Cycle can only be installed if the booth is retrofitted with the Automatic Pressure Control, Evelyn Baker said; otherwise they’ll just get more dirt in the paint. Prior to becoming a Garmat paint booth distributor in 2011, Baker’s focus was exclusively on maintenance and repair, yet customers would frequently ask him for purchasing advice. “For many years, people would ask what brands to buy, but I never would recommend any single brand,” Baker said, adding that he’s now changed his stance. Two things a shop owner should look for in a spray booth, he said, are a direct-fired burner and belt-driven motors. Direct-fired burners are basically 100-percent efficient, he said, pointing out that indirect-fire models are only up to 80-percent efficient. There are indirect models on the market because in Europe, shop owners do not have access to natural gas like in the U.S. and must use other means of fuel in the burner. Spray booths with direct drives, instead of the belt-driven style, cannot be modified in terms of CFM, Baker said. “They’re susceptible to vibration damage, must be perfectly balanced, and are more expensive to maintain.” If the motor goes bad, he added, they are proprietary and can only be purchased from the manufacturer. Regardless of the service a vendor is offering, trust must be at the center of the transaction, the Bakers said. “I remember telling an old business partner several years ago, that if the Garmat line ever became available in the Michigan area, I would jump at the opportunity,” Baker recalled, citing it as a catalyst for his Colorado business. “After spending a year as a Garmat distributor, we could not ask for better support from all angles,” he said.